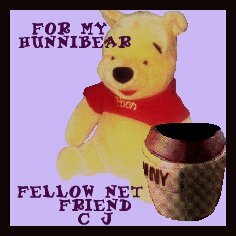 This is my special Hunnibear from a special friend I met on the web. Her name is C.J. and she is a very sweet person. 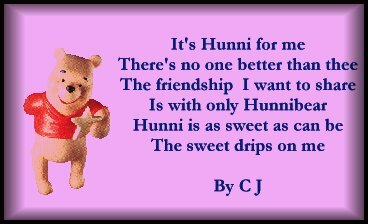 I Love this gift she made for me, Thank you so much C.J.! My Very First Award!! I'm So Pleased! A New Award!! 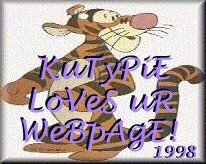 Thank you KuTyPiE! Hello My 4ever Friends, so you have made your way here to find a piece of a special puzzle, well, you've come to the right place! Right now these aren't working but on the next page I have another guestbook I would love for you to sign! My Guest Book!